Last week I had an occasion to indulge in the Writer’s Happy Dance. Well – I didn’t actually do a proper dance – more of a geriatric gyration. With lots of clicks and groans in my ancient bones. The reason for this joyous occasion was a notification that one of my stories has been accepted for publication in an anthology. It also means that I am in the running to win a prize in a writing competition. The competition was jointly run by Radio 1079 Life (Life FM) and Tabor College. Tabor was where I did my Masters Degree in Creative Writing; I can highly recommend their creative writing programme which can be studied externally. The competition is called “Stories of Life” and are based on true-life experiences and must contain some element of one’s Christian faith. I initially found it challenging to come up with a viable story concept, but once I started, the words flowed easily. I must admit that I put myself under a little pressure, leaving my submission to the very last day and posting it the website at 11:35 pm, just 25 minutes before the closing time of midnight. I always say that I shouldn’t put myself under so much stress, but it happens far too often. The story I wrote was based on one of my experiences while travelling in Nepal about ten years ago. I thoroughly enjoyed my holiday in Nepal and vividly remember many of my amazing experiences. You can read some my experiences here. Submitting stories and poems to competitions is an excellent way of improving your writing skills. I must admit that I don’t do this nearly often enough. By pitting one’s writing against other writers, you get to hone your writing, editing and proofreading skills. Some competitions even give feedback from the judges. This helps you to further improve your writing until you regularly get listed in the short list or get a commendation from the judges. Winning some prize money is wonderful, of course, but this should never be the prime reason for entering. A prize is a lovely bonus. Constantly improving your writing should be your main aim. Write the very best story you can. Rewrite, edit and proofread the story until it sparkles. Or grabs the readers’ throats. Read – and reread – the rules set out by the organisers. Stay within the word limits, not too short and never over the maximum word count. Read your story out aloud, or get someone else to read it – this will help you to find typos and errors in grammar. Submit before the due date. The same rules apply to poetry, except that the organisers usually stipulate the maximum length and sometimes the theme. A few years ago I was delighted to actually win a national poetry competition. I not only did the Writer’s Happy Dance, I think I also gave a yell of delight. The prize money was a wonderful bonus, too. I can now put “Award-winning poet” on my resume – how cool is that? You can read some of my poetry here. As I said above, I don’t enter nearly enough competitions. I have hundreds of suitable poems and dozens of good stories ready to go. It is one of those things I always intend to do, but I need to enter far more regularly. I do have this as one of the goals for this year, but I am a long way off reaching my goal. songs – well, one song! In addition to the above figures I have self-published over the last 10 years more than 4000 articles combined here on this writing site, and on my other sites, Trevor’s Birding and Trevor’s Travels and on our church website where I am the webmaster. That’s a heap of words. And I have many, many more waiting to be sent off to various publications, and heaps more ideas for more stories, novels, poems and articles. Finding a balance between creating new writing and submitting one’s writing is always a fine line to walk. I must admit that I err too much on the side of not sending out my writing to places where it stands a good chance of being published. It is worth taking a look at; while you are gone I think I will prepare a few submissions of my own. After all, I’ve had a list of them ready for a week now. Over the years I have submitted quite a few poems and stories to writing competitions, with a moderate level of success. I should enter far more than I do because I have such a vast number of poems and a few stories that the only problem is actually choosing which pieces go where. I have also been intending sending off far more items to magazines and journals in the hope of being published. Submissions for this creative writing competition are now open and will close on March 6th 2015. Only one entry for each category – poetry and short story – is allowed per person. Unlike most competitions, entry for this one is free. This is the second time this competition has been offered and I intend to submit a poem in the next day or so. I do not have a suitable story on the set theme “Hope against hope” and I am hoping that some inspiration will come my way in the next week or so. When I was completing my Masters degree at Tabor a few years ago we often talked about the possibility of hosting a writing competition but nothing came of it then. It is therefore great to see it finally get off the ground and last year’s event was a huge success with hundreds of entries from all over Australia. The 2015 Tabor Adelaide Creative Writing Awards – for details, conditions and how to submit an entry. I haven’t been sharing some of my recent publishing successes here, but this one is a little special to me. 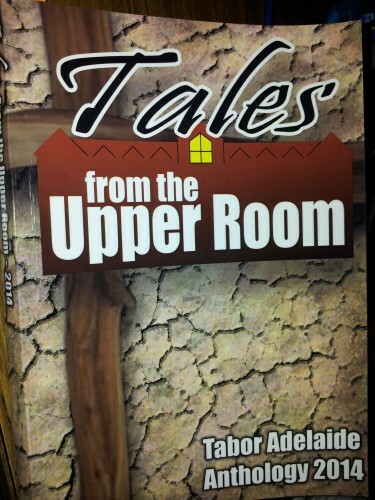 Two nights ago I attended the launch of the latest volume in the series “Tales from the Upper Room“, and anthology of stories and poems written by those associated with Tabor Adelaide. This is where I completed my Master of Arts Creative Writing a few years ago. The anthology is now in its eighth edition since first being published in 2005 by the staff and students who were the first to be involved in the creative writing course at Tabor. A new volume has appeared every year except one. My stories and poems have appeared in all but the first three volumes. The collection of stories and poems have been submitted by students, staff and alumni and their family and friends. Each edition is an eclectic collection of the deeply moving, the curious, the quirky, the humorous and sometimes surprising. Many are confronting, all are well written and most are worthy of revisiting. I only had one poem in this edition, but that’s okay with me. It’s great to see many new names attached to the selection; this shows that the creative writing courses are alive, thriving and raising the bar of literary excellence. A word of explanation about the title “Tales from the Upper Room” is in order. The creative writing courses had as their home in the early days a room on the third floor, affectionately known as The Loft. It conjures up images of the writer’s garret of legend, and it was here that the first meetings of the writers’ group met and where the concept of this anthology was conceived. 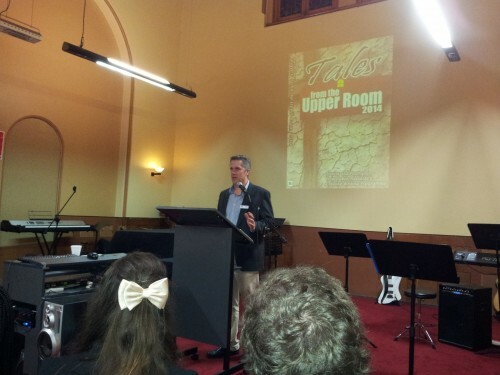 But the “upper room” also brings to mind the room where Jesus and his disciples met for the last supper before his crucifixion. Tabor Adelaide started as a theological college, and most people associated with it are Christians, adding an interestingly significant appropriateness to the title. The launch also included the announcement of the winners and runners-up of the inaugural Tabor Writing Competition. It had two sections: poetry and short stories. This was a brave new venture and with 299 entries was immensely successful. Entries came from every state and territory of Australia. I should add here that I decided not to enter this time. I must set my sights high and aim to enter next time around. Late last week our next door neighbour asked permission to enter our property over the weekend. He was planning to trim some of our trees leaning over his fence. Not only would this be much tidier, it would reduce the fire hazard on his property, something we have to be very aware of here in South Australia, especially as another summer is approaching rapidly. As he started Friday afternoon I went over to chat to him, asking for more details on what he proposed to do. One of the tools he had hired was a chainsaw with a long extension arm on it. At full extension he could reach nearly 5 metres while standing safely on the ground. I immediately saw the potential regarding one tree in our garden. I had forgotten the obvious. A few months ago I had tried climbing up a ladder to lop the top two thirds of a tree near the house. From about two in the afternoon this tree shades our PV solar panels, diminishing their efficiency for the rest of the afternoon. Even cutting this tree to the base will not kill it. In fact, mallee trees thrive on this trimming and will regrow quickly. My attempt to trim the tree was unsuccessful; it was unsafe at that height. The obvious solution was to hire one of those very useful chainsaws with an extension. Doh. I offered to help my neighbour in his trimming – if he would come over and trim my tree. In about ten minutes the job was done. I then spent the next few hours helping him in return, offering to tidy up after him cutting and getting rid of the cut wood. Next winter we will keep warm with this wood. Checking that the grammar is correct. Rewriting repetitive or hard to understand parts. Checking the publishers requirements; don’t send a poem to a car enthusiast’s magazine – unless they specifically are asking for poems about cars. Check the maximum (and often the minimum) word count required; this is especially important in writing competitions. Get someone else to read your writing, checking for understanding, grammar and spelling. And typos. Keep a copy of your work. Check you’ve included your name and contact details. Keep writing. Don’t twiddle your thumbs while waiting for the publisher to reply; it could be months!